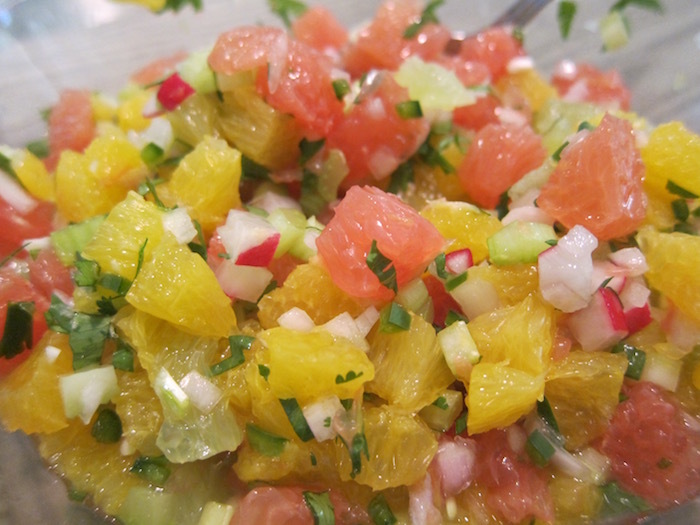 Citrus salsa is one of the great fresh and spicy gifts from the Mexican kitchen. 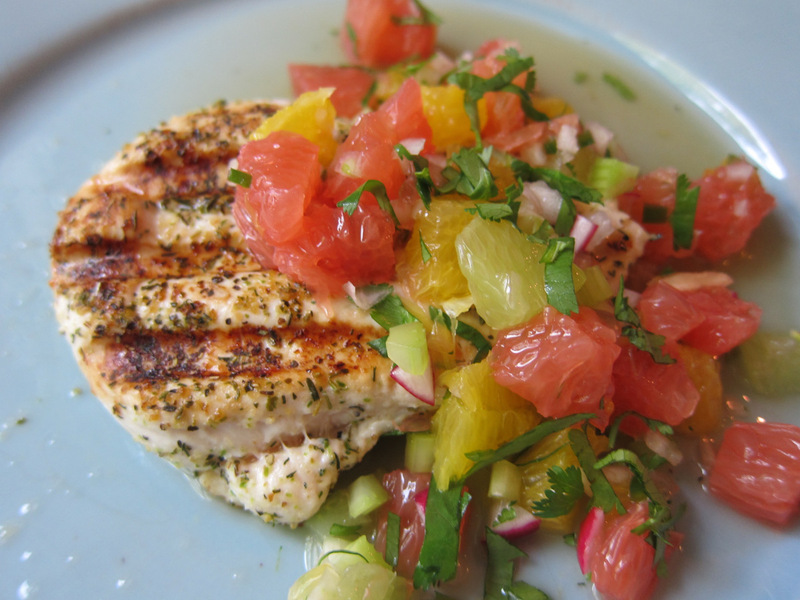 Sweet, hot, salty and tart, citrus salsa is a natural partner for anything grilled or roasted, especially fattier meats like pork or dark-fleshed fish like tuna, bluefish or mackerel. But the craziest thing about this salsa is how few calories there are in a huge helping — less than 50! While not designed as diet food at all, it’s a dieter’s dream. Salsa is a raw sauce, of course. So there’s no cooking involved. What is absolutely necessary, however, are two new, or absolutely sharp knives — a paring knife and a slicing knife. I also recommend using a synthetic cutting board (vs a wooden one) since things get pretty juicy during the salsa prep. The salsa requires fairly precise dicing into three sizes: 1/16-inch (tiny), 1/8-inch (small) and 1/4-inch (standard) dice. 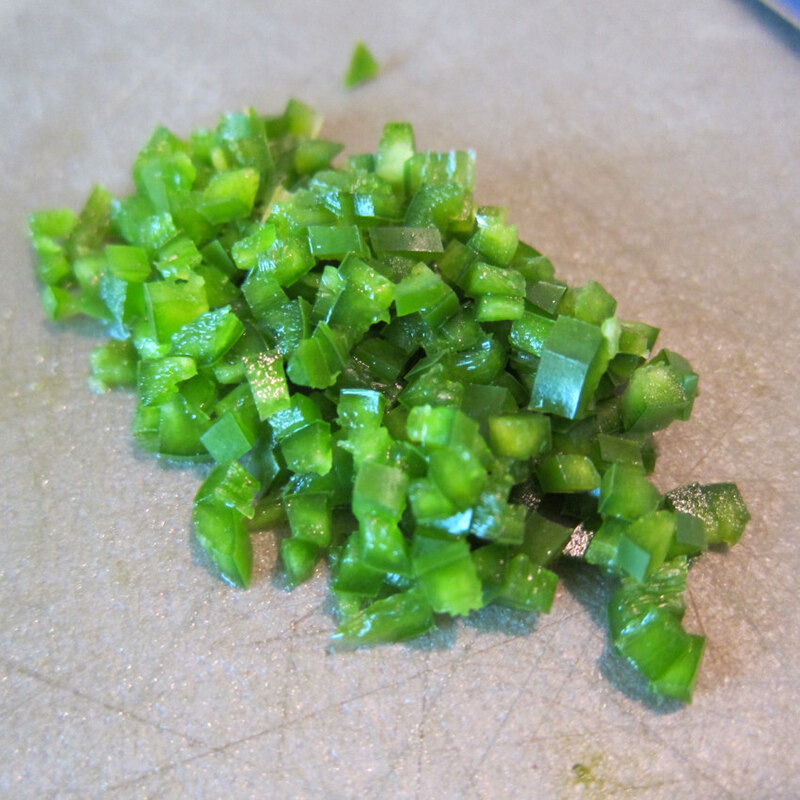 And here’s why: the serrano chile is very hot and the small it’s cut the more evenly the heat is distributed. When I work with a serrano, I use disposable gloves. I cut the ends off the chile, cut it down the middle and remove every last seed — those seeds are fiery! First, I cut it into tiny strips. Then I gather the strips together and cut crosswise. 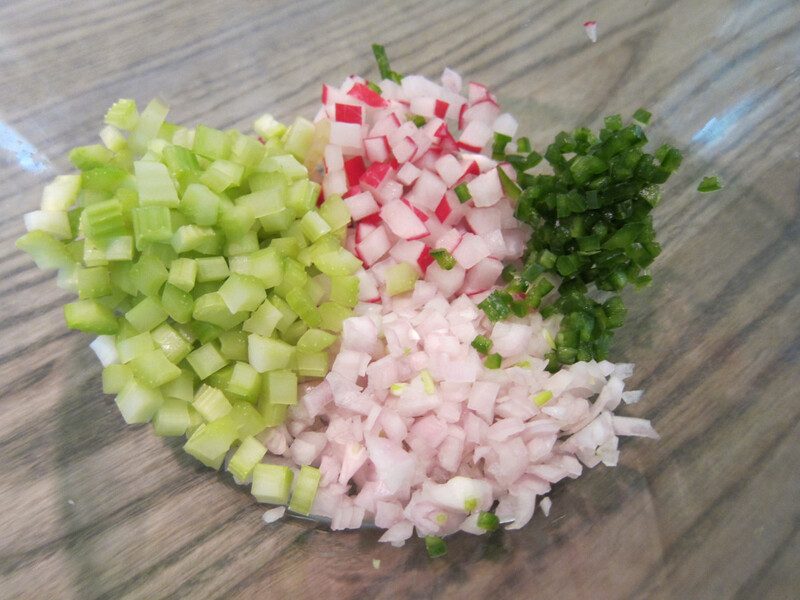 Flavor distribution is the same reason to cut the shallots into a small dice as well. Celery and radishes can be slightly larger. Dealing with the citrus is like making fruit salad — first by cutting away the rind and membrane, then by freeing wedges of the peeled fruit from the membrane. 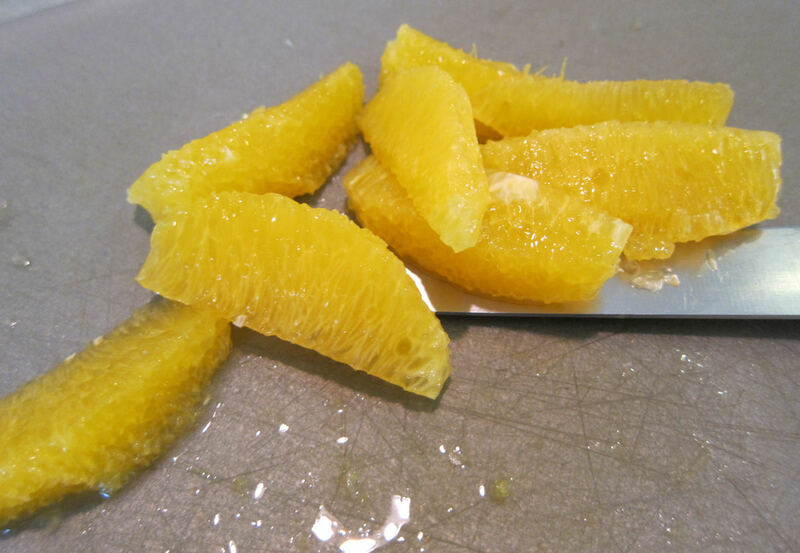 Since citrus tends to be delicate, a sharp knife is needed to cut the pieces cleanly. Plus, the more precisely things are cut, the better the salsa looks. And that’s it! 1. Set a medium bowl near the cutting board. Cut the radishes and celery into even 1/8-inch diced pieces. There should be about 1/4 cup diced radish and 1/3 cup diced celery. Cut the shallots into 1/16-inch dice or as small as possible. There should be about 1/3 cup shallots. Transfer radishes, celery and shallots to the mixing bowl. 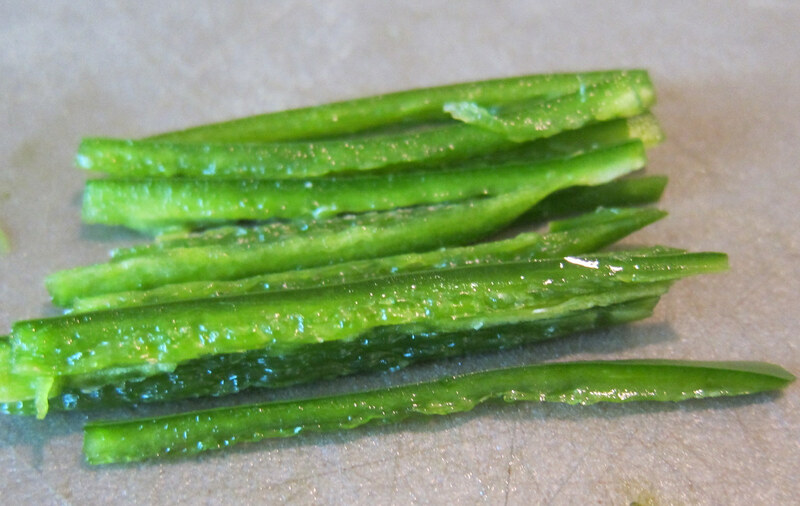 Using protective gloves, slice the serrano lengthwise into thin strips then cut crosswise into 1/16-inch dice or as small as possible. Add serrano to the bowl with sugar and salt; mix well. 2. Using a sharp knife, and working on each fruit separately, completely remove exterior peel and all traces of white membrane from the oranges, limes and grapefruit — as for fruit salad. Then, working over a small container to catch the fruit juices, use a paring knife to remove whole triangular fruit sections by cutting on each side of the interior membranes. Hold each empty membrane over the bowl and squeeze to remove as much juice as possible — reserve the juice, then discard. Cut the fruit sections into 1/4-inch pieces, keeping them separate in order to measure. 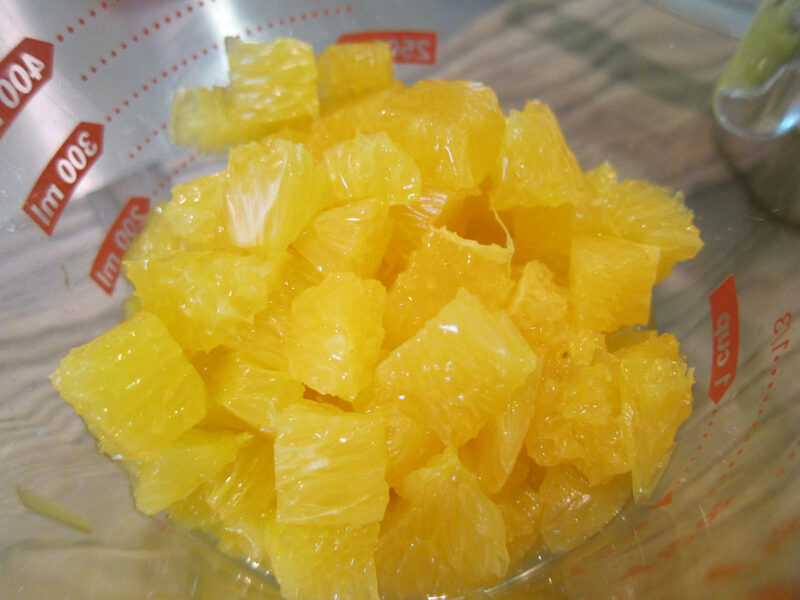 There should be about 1-1/3 cups orange pieces, about 1 cup grapefruit pieces and about 1/2 cup lime pieces. Add all the citrus pieces to the bowl with the minced vegetables. 3. To finish the salsa, stir in cilantro and add enough of the reserved citrus juices to moisten — but not drown — the salsa. Adjust seasoning with additional sugar as necessary to make salsa tart but not sour. (Can cover and refrigerate for 2 hours before serving. 4. At serving time, bring salsa to room temperature, stir well. Use 1/4 cup over each portion of grilled or roasted fish, seafood, chicken or pork. Citrus Salsa is the very definition of a “bright” flavor. It’s acid without being especially sour which is what makes it ideal for foods that aren’t especially lean. While it’s prettiest with white meats such as swordfish, chicken breasts or pork chops, that shouldn’t limit its use. I wouldn’t hesitate to use this as a ceviche base either. Just add the cut up shrimp and scallops. If there is any salsa juice left over it could be amazingly delicious in some type of tropical cocktail. I only drink wine so I don’t know which drink to recommend — I’m just throwing the idea out there. Forget trying to prep this one night ahead. Seriously, forget it. The fruit doesn’t hold up well, the cilantro will get soapy and the chile will lose its snap. Everything can be cut up, say in the morning, wrapped in plastic or bagged tightly and refrigerated until shortly before serving time. I like to mix this up and let it stand at room temperature (nothing to spoil). Two hours is ideal. It also can be served cold. Cook’s choice. Serrano chiles - jalapeños can be substituted. Also, heat can be amped up by adding 1-1/2 serranos or even 2. Shallots - one small Spanish onion or half a red onion can be substituted for the shallots. Sugar - If you want to eliminate the tiny amount of sugar (mainly for the Paleo people) jicama could be substituted for the radishes. This is a bit of a pain since there will be a lot of jicama left over. And then I’d want to increased the chiles to 1-1/2 to balance out the sweetness.